After creating history by organizing Ragnarok’09 a whole night rock show on 31st December Unseen Underground has started their this year’s journey with the 6th edition of Unseen Underground Pub Fest last Sunday at Geoffrey’s pub in association with HMI guitars . Rock fanatics in the country are already very excited about the national tour of Unseen Underground in 6 different cities along with 100 upcoming bands from ever nook and corner of the country within this year. Unseen Underground Pub Fest VI was the opening show for the mega series of rock shows that are planned to happen this year. UUPF-VI had featured 4 talented bands of different genres, from Funk Jazz to Technical Death metal. The Fest was declared open by playing the promo for the upcoming Escher’s Knot’s EP “TESSELLATIONS” which is officially getting released by this month. Franks Got The Funk a Chennai based Funkjazz band talented with a group of young musicians opened the show with a zeal. They created an ambiance suitable for the kind of music they were playing, which gathered the crowd near the stage. Their Jazzy Funk music was quite unique to the crowd that gathered for the night. Bjorn’s vocals and guitar works amazed the listeners and made them ask for more. Due to their recent line up changes they ended their performance with their popular self titled song. 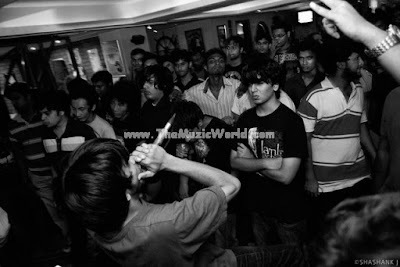 Their performance was tight and Chennai should certainly feel proud for bands like them. 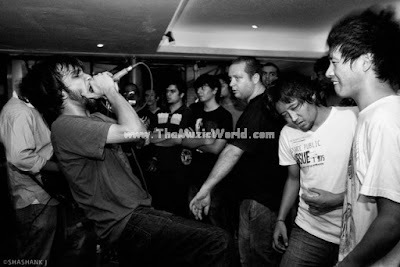 Subsequently Blind Image a contemporary metal band from Chennai took the stage with a meticulous vigor. After the release of their 2nd Album More Than Human they have created a strong fan base in the city. The crowd requested them to play their own comps and greeted them with equal energy. Their new line up was appreciated by everyone. They started their performance with Glitch In The System from their second album followed by Deciphered, Ominous, More than human, Sepia Tone Sunrise, Axioms of synergy and Allegiance In Defiance from the same album. It is much appreciated that Indian bands now a days cover their own music only. Shri & Siddharth’s guitar work was appreciated by the fans and their performance was energetic. Blind Image then offered the stage to Spitfire a melodic death metal band all the way from Bangalore. They started with their own composition Minds In Disguise followed by Burn It and Devil Driver’s cover Hold Back The Day. The band displayed a greater energy on stage for songs like Wild Impulse and LOG cover Black Label. Chennai already has a good number of fans for this band and they gained few more after their performance. The Last band for the night was none other than Escher’s Knot. Most of the people among the crowd seemed to know them as well as their own compositions and most of them were singing along with the band. They started with their own composition Up For Nothing followed by Textures’ cover Drive, Mayan Calendar, This Page Has Been Left Intentionally Blank. Their new instrumental track Hyperspace surprised the crowd . They concluded the show with Break The Cypher. Chennai rock fans had a fantastic evening. If you have missed it this time do not forget to look out for the next show. Interested bands can send in their entries to unseenunderground@gmail.com to take part in national tour to 5 other cities. Deadline of sending entries in 5th June 2010. I am sure you rock fans don’t want to miss any of the shows!